Porky Pig’s Feat is a classic slice of surreal, physics-defying “cartoonism” from the vaults of “Termite Terrace”. This 1943, Leon Schlesinger produced short features some of the sharpest visual work in the Warner Bros. canon, greatly enhanced by the voice characterisation of Mel Blanc, here covering all five characters. Schlesinger, notorious for his business savvy, was responsible for hiring both Blanc and Friz Freleng, who along with Chuck Jones and others, would cultivate the Looney Tunes franchise. Another of the Porky and Daffy misadventures, this particular cartoon offers a relatively early glimpse of these characters and the development of their personalities. At the onset, a round-headed, somewhat crudely rendered Daffy Duck has gambled away the money he and Porky had set aside to pay for their hotel room, while shooting dice in an elevator. Supposedly out, “cashing a cheque”, Daffy, in a last gasp effort to save his fallen spirits and make a quick escape with his pal Porky, throws himself upon the obese hotel manager, proceeding to assault and harass him as only Daffy knows how. Of course this doesn’t work out and it falls upon Porky’s shoulders to try and save the day. Director Frank Tashlin adds a notion of playfulness to the chaotic abandon of the Broken Arms Hotel, where you’re billed 43 bucks for goodwill and air. Having established himself, alongside Bob Clampett, with a string of early Porky Pig cartoons, Tashlin would eventually move on to live-action feature film work, directing, amongst other things, a number of Jerry Lewis comedies (including The Disorderly Orderly, 1964) – a natural progression from frantic cartoon making to directing one of the most “animated” actors of the last century. Nevertheless, his cinematic eye was already evident in the work he did at Warner Bros. – the use of space and perspective in Porky Pig’s Feat resembling moments in Orson Welles or Alfred Hitchcock’s work. Like many of the cartoons of this era, the writing lacks the general sharpness of later efforts. Daffy’s boisterousness is still largely one-dimensional. (He was yet to develop his profound feud with Bugs Bunny; an obsession which would dominate many of his later, megalomaniacal pursuits, receiving a little kickstart at the end of this cartoon.) Much of the humour of Porky Pig’s Feat comes from the sheer preposterousness of what develops and its rapid-fire visual imagery. A lively sense of colour and dimension backed by a smattering of wordplay (“My card, you cad”), humourous signs and the obligatory smacking of characters with objects, drives the action along at a furious pace. Perhaps due to the time and circumstances surrounding its release, a somewhat anti-French sentiment is present in this cartoon, though not entirely mean-spirited. The hotel manager is a model of French stereotypes: pompous, smoking, with a pointed moustache and wearing a monocle. Daffy’s sarcastic dismissal of the manager as “Robe-thhh-Pierre”, before challenging him to a duel on the “Field of Onion”, is reflective of the era’s disparate global atmosphere, and the national stereotypes that fuel many of Warners’ cartoons and characters. This type of device works toward establishing a unity between character and audience as allies in the same war, an element further expounded upon with the Bugs Bunny character throughout the first half of the 1940s. Intimations of Leon Schlesinger’s shrewd business acumen can be read into this and many other pictures he produced during his time at Warner Bros. 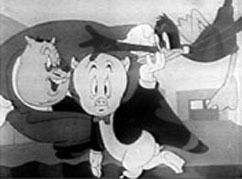 Sometimes taking to appearing live, or having characters reference the idea of the “Leon Schlesinger cartoon” (as Porky does here), his flair for marketing and self-promotion helped shape the style of these shorts, ensuring they would continue to be financed throughout the Depression and World War II. While competitors like Walt Disney began to focus more on family-oriented animated features, Schlesinger provided an environment for his cartoonists to create in ways that were less common at other studios (mainly by leaving them to their own devices). In the end, the exact nature of Porky’s feat remains somewhat unclear. Three distinct possibilities arise, the most impressive of which seems to be his ability to tolerate the incomparable Daffy Duck, whose wild exploits turn an otherwise unpleasant situation into a series of violent attacks and bumbled escape tactics which threaten to obliterate them at every turn. Porky remains true to Daffy, shining a beacon of humble sanity through the fog of Daffy’s madness. These two characters would continue on in the buddy tradition with many different directors and in many different situations (e.g. outer space, the story of Robin Hood, etc. ), with Porky undergoing some substantial but never permanent character shifts. But these earlier shorts reflect the manic, creative energy of the cartoonists, before pure artistic achievement took a backseat to the more careful cultivation of the Looney Tunes characters’ public personas.